The Alexander lesson consists of observation and simple movement lending clarity and understanding to how you function as a unit. The teacher gives the student tools to undo hindering habits and access natural coordination. Freedom and ease follow. An example of simple activity is the work using a chair – how to sit, get up, stand, and get back into the chair. While the teacher guides the student verbally she applies her skills with a subtle touch allowing the student to experience hands-on direction. In the Alexander workshop we will explore the spines integration with the rest of the body with special attention to the the ribs, hips and legs. Noortje provides Individual alexander lesson through out the summer course by appointment €20. Lessons will be held on Saturdays and Sundays in the attic studio around the corner from the OT301 building between 12:00-16:00. Wilhelminastraat 139-3, 1054 WC Amsterdam (top floor studio). A board will be hung in the BAR area where you can sign up for appointments. (If you are doing the Saturday performances you will need to choose to do Sunday Alexander sessions due to your lighting rehearsal in those hours). I received my Alexander training at the ATON, in Amstelveen, under the direction of Arie Jan Hoorweg. Since 2004 I have been teaching there on a regular basis. I run my own practice in Amsterdam and at the Gimsel Academy in Rotterdam. My practice includes workshops at the conservatory and dance schools. Noortje is STAT certified and is a member of Nevlat. 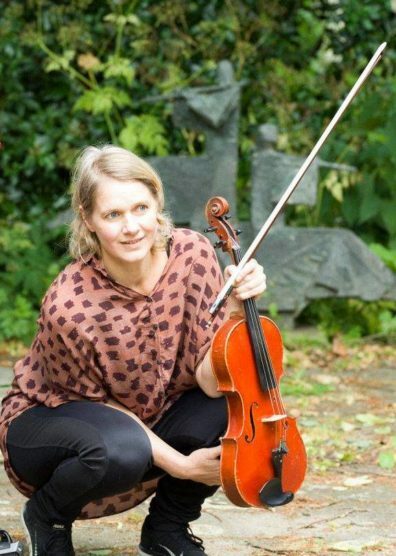 Also a professional musician, I graduated in 1997 as a violist from the Sweelink Conservatorium in Amsterdam. I have performed with various music ensembles, dance and theatre groups, such as Insomnia, ‘t Barre Land, Orkater, Scapino Ballet, The Metropole Orchestra, Lysn, Malte Schillers Red Balloon. I have trained improvisation with Katie Duck and Alfredo Genovesi and have been teaching Alexander technique at the Summer workshop since 2011.